I spend a lot of time in my kitchen as I really enjoy cooking. However to get good results its important to have the right equipment and tools in the kitchen. For me more than anything else in my kitchen, I need to have good quality pots and pans. 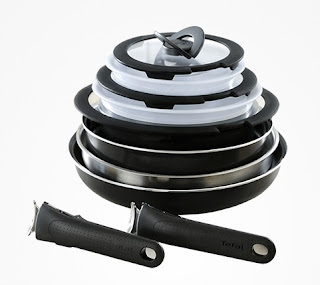 For many years now I have equipped my kitchen with Tefal range. I find that the quality of the pans and their non stick finishes allow me to cook food evenly and healthily using very little oil. I am a big pan of Tefal so recently when I was invited to a Cookery master class hosted by Tefal to test out their Tefal Ingenio pans at L'atelier des Chefs I was really excited. The beauty of these pans is that they feature a special non-stick coatings and patented Thermo-Spot technology that lets you know when the pan has reached optimum cooking temperature. Furthermore the pans have a detachable handle allowing you to place them in the oven or fridge . 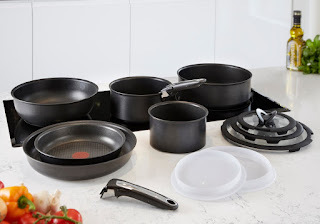 All the pans also come with an additional hermetic Ingenio lid that can be used on the pans if you want to cover and store food in the fridge. For easy storage all the handles are detachable making it easy to stack the pans so that they will fit into the smallest storage space. 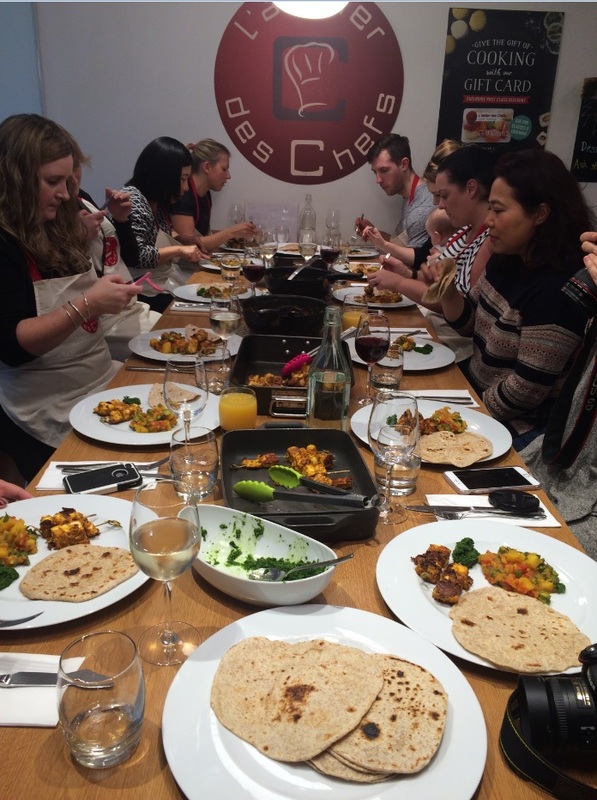 At the masterclass we were able to put to test the Tefal Ingenio range of pans. I found the pans really lightweight but at the same time sturdy. 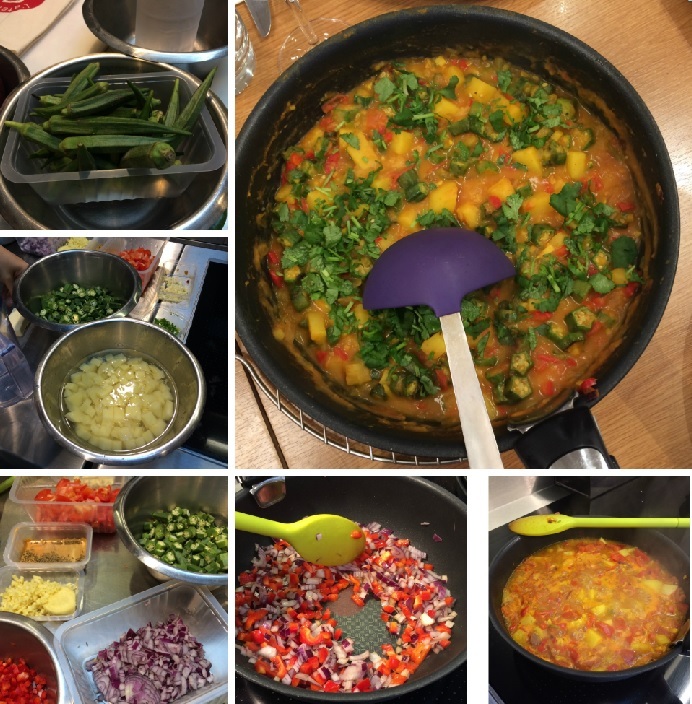 We split into two groups and after a demo from our chef for the day, we started preparing our ingredients for our feast of Roti, Green Coriander Chutney, Tandoori marinated Chicken and Paneer Skewers and a Karahi Okra and Potato curry. We made Tandoori marinated Chicken and Paneer Skewers for starters. Aromatic spices were roasted in the Ingenio Pan and then ground to a powder in a pestle and mortar. The ground spice was added to yoghurt and this marinade was used to flavour the paneer and chicken. 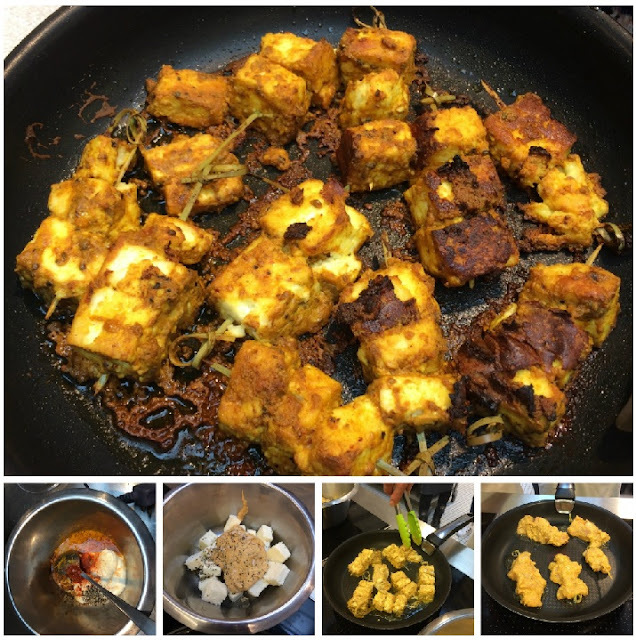 Once they had absorbed the flavours the chicken and paneer were threaded on skewers and pan cooked before finally finishing them in the oven. Our next dish was the Karahi Okra and Potato curry, a delicious potato and okra curry in a thick onion and tomato based curry sauce. After sauteing the garlic and onions, we added finely chopped peppers, tomatoes and spices, together with the potatoes. The curry was cooked for 10 minutes after which we added pan sauteed okra and garnished with freshly chopped coriander leaves. 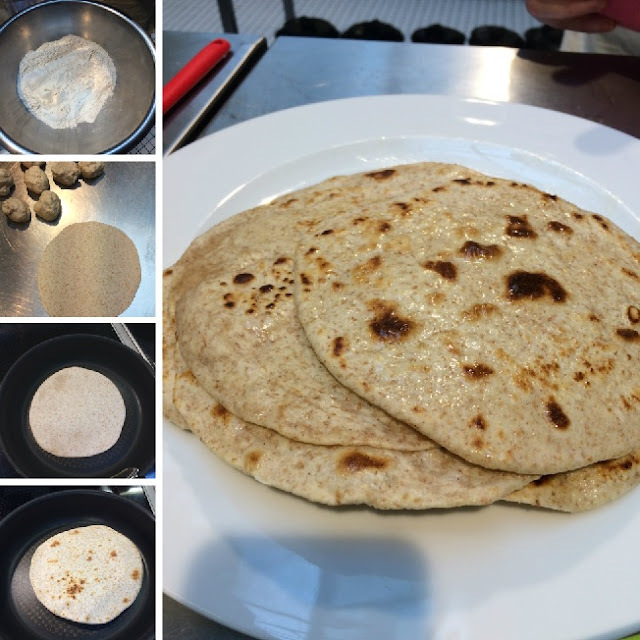 To accompany the curries we made rotis , an Indian flat bread. After making a dough of flour and water, it was left to rest. Once ready it was rolled into round circular rotis and roasted in the Ingenio pan. The rotis were smeared with butter to add softness and extra flavour. Finally we made a coriander chutney to go with the skewers. The meal prepared we were able to sit and enjoy the food with a glass of wine. 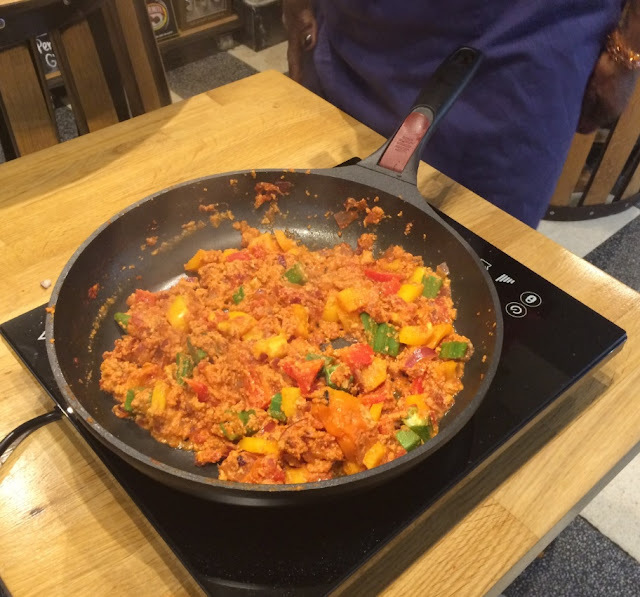 Cooking with the Tefal Ingenio pans was really a good experience. The masterclass was really fun and extremely enjoyable. As they say many hands make light work, this certainly was the case as the whole team worked really well together to create the most delicious and mouth watering feast. If you like the sound of this class, you too can experience it at L'atelier des Chefs. It would make the perfect Christmas present for a foodie friend or family member. You can use this 10% Off promo code "TEFAL10" which is valid on their 60min, 90min and 2hr classes. This post is in collaboration with Tefal, all views, opinions expressed are of my own experience. All photos taken at the event are my own except the two product photos that were courtesy of Tefal. 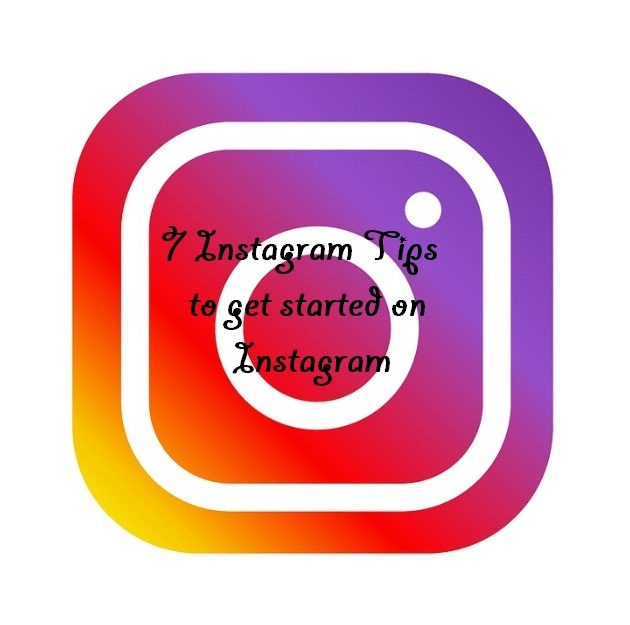 7 Instagram tips to get you started on Instagram. I am no expert on Instagram but over the past few months, I have come to enjoy it very much, it has by far become my favourite social media platform. 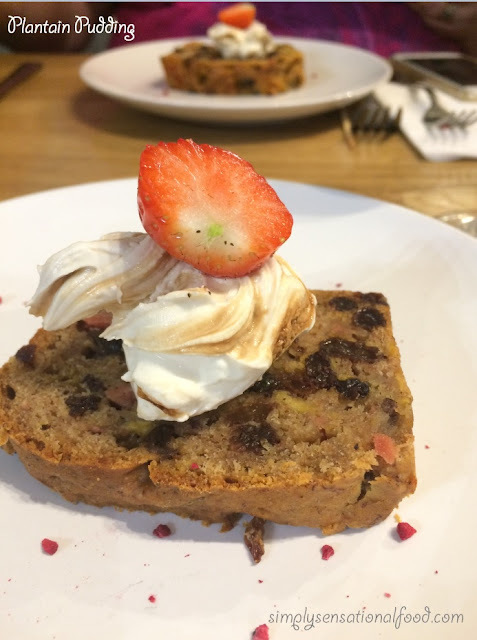 Since I mostly blog about food I find that Instagram is a really nice platform to share my food photos which are very visual and it also helps me to engage with other foodies too. Here are a few things that that have worked for me when I started my account so I am sharing them in this post. There is no right or wrong, these are some ideas that I find worked well for me. If you are a blogger it is a good idea to have same or similar user name on all social media that is same as blog so that it creates an identity that links to all your platforms. Make sure you set your profile to Public. Keep the bio interesting, precise and to the point that tells the follower what your account is about. Include your blog url and email address for people to be able to easily contact you. Don't be tempted to post a blurred photo that are out of focus. Instagram is very visual, try and make your photos eye catching and beautiful. Try not to post a mix of genres in a random fashion, attempt to post at least three pictures that follow on from one another or can connect in some way. Use hashtags that are specific to your post and add them at the end of your post, they provide a way for others to find your photos under a specific theme or topic. Never add hashtags in between your post description as it makes it look spammy. Take advantage of trending hashtags and if they are relevant to your post use them. Post regularly preferably have a set time pattern but do not spam. Write a description to go with your image, a good description, location etc helps the reader know what your content is about . Some times to create more interaction ask a question , this will encourage followers to interact with a reply. Follow and interact with other users that have similar content to yours. Visit your favourite accounts, interact with other users and like and leave meaningful comments on their posts. The most important thing to remember is to create a Vibe and keep it regular. This can be achieved through using a set colour palette, choosing a set theme ie travel, food, crafts and being consistent with your posts. Once you have set up your instagram page be it for personal use or to promote your blog or brand its important to maintain it.You can even get advise and help from sites such as Vibbi which is a one stop shop for all instagram marketing. Is there any other things that I should be doing to grow my instagram account and get more engagement?? I would love to hear your tips, do share them in the comments below. *This post is in collaboration with Vibbi. I have recently discovered Ghanaian food and my love for African dishes has been rekindled. I am in love with all the spices and all the amazing flavours that are used in the cooking. 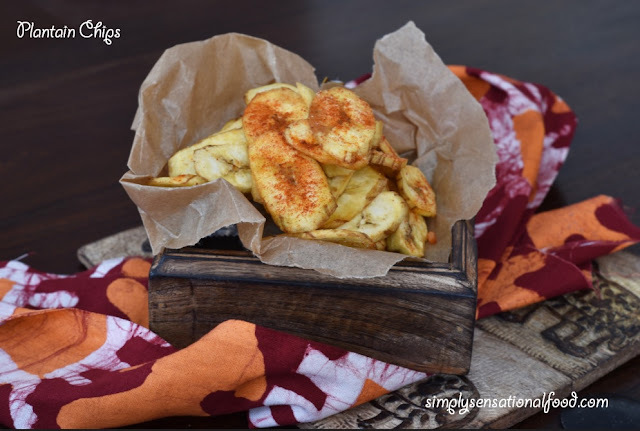 I have been trying many Ghanaian recipes and over time I shall endeavour to share them on this blog. 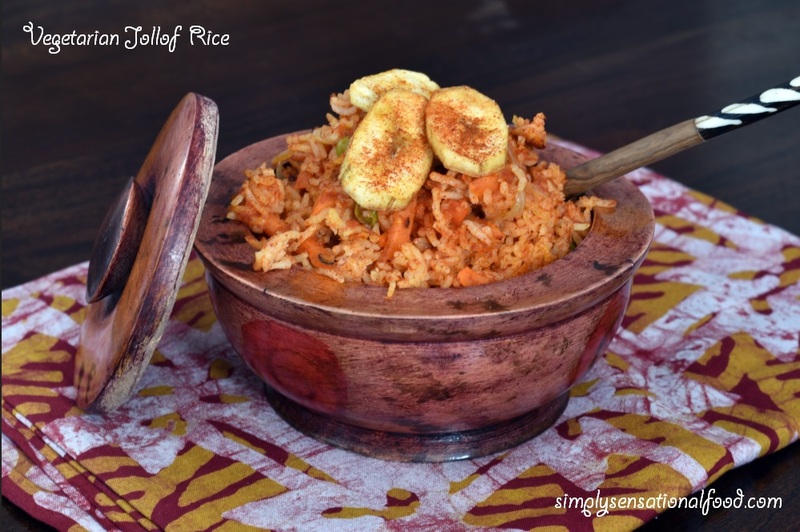 I recently created a recipe for Jollof Rice with Plantain Chips which was super delicious and has become a firm favorite amongst my family. 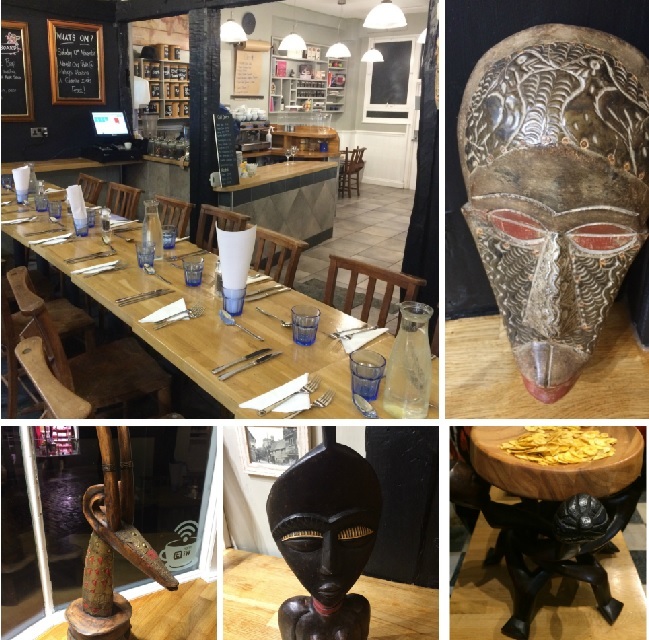 Through my blogging journey I am fortunate to get many opportunities to attend events one such opportunity came recently when I was invited to attend a Ghanaian themed supper club hosted by Patti Sloley at Halseys Deli and Eatery in Hitchin. Patti is a chef, a cookery teacher, an author and a remarkable lady. Her personality is so vibrant that within five minutes of meeting her I felt I had made a friend for life. She is extremely passionate about what she does and it clearly shows in her food which I was excited to sample. The evening started with drinks and nibbles, Plantain chips are moreish and you could nibble at them all night. I love them and I recently made a batch of my own, you can check the recipe here. 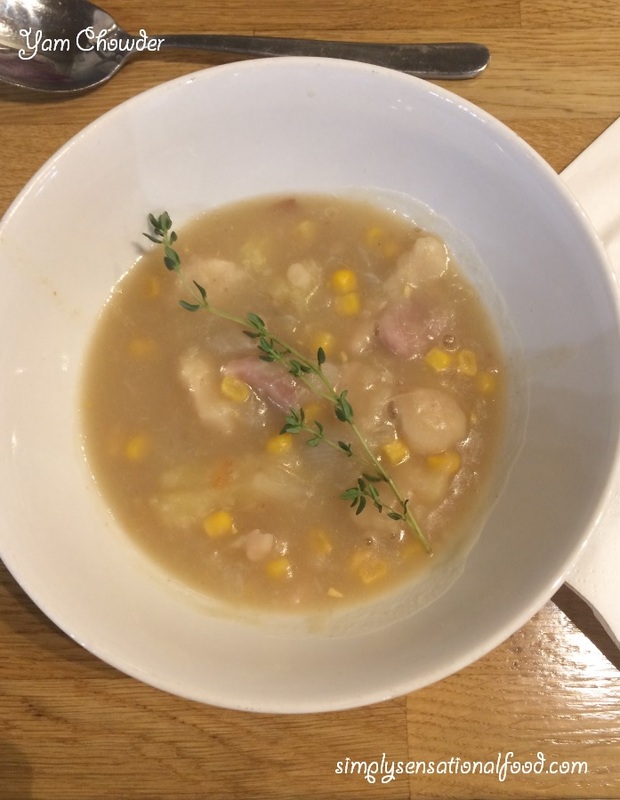 Once seated we were served a delicious warm Yam Chowder made with Coco Yam, Yam, Guinea Pepper and Sweetcorn, the non vegetarians had the addition of bacon to theirs. The Chowder was spicy, beautifully flavoured and rich in texture and flavour. It was the perfect starter as the Autumn weather was rather cold. 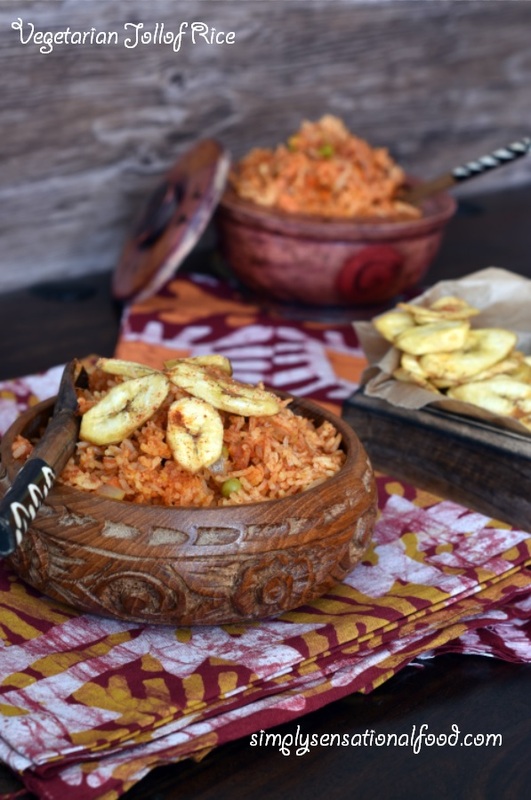 For the main course menu, there was Egusi , its a type of Ghanaian stew that can be made with fish, meat and vegetables and its thickened with ground melon seeds. The non vegetarian versions had two types one with fish and one with meat. The vegetarian version was made with peppers, onions, garlic,scotch bonnet chilli, okra all cooked in a tomato base and thickened with ground Egusi (melon seeds). Patti demonstrated how to make the vegetarian version of the Egusii in front of us. It was a wonderful experience to watch her create the dish live. You can watch Patti cooking this beautiful dish in the video below. 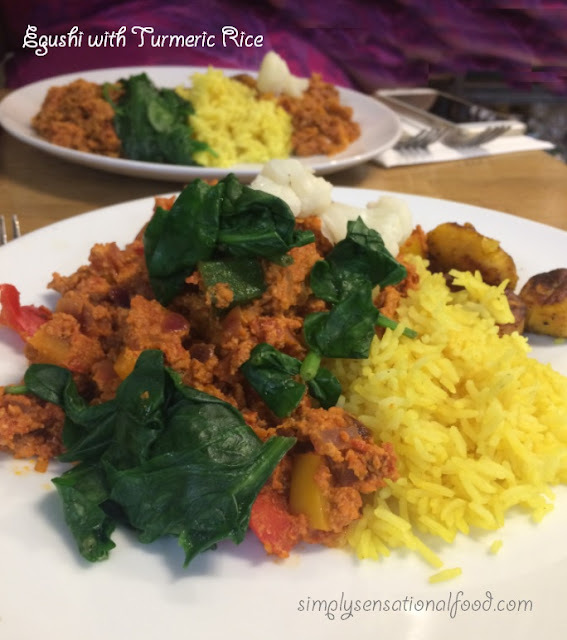 The Egusi was served with turmeric rice, sauteed spinach, cauliflower florets and Spiced Fried plantain. It was comfortably hot due to the addition of the scotch bonnet chilli. The flavours were delicious and the texture of the stew from the Egusi seeds was thick and creamy.The main course was colourful, beautifully presented and simply divine. 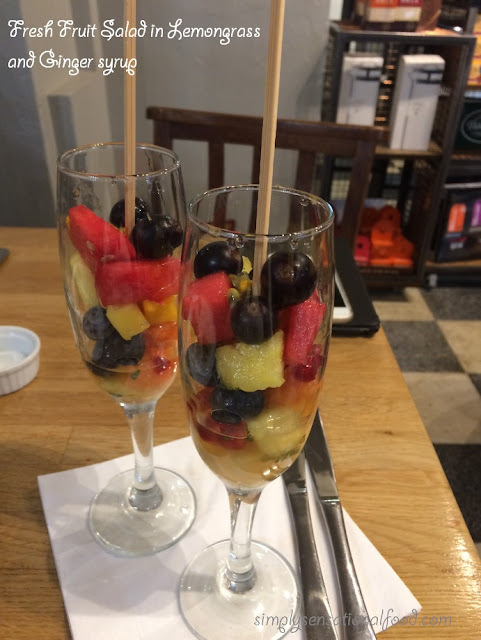 With out tummies full and our palates well seasoned from the spice, we were served a palate cleanser in the form of an aromatic fresh fruit salad served in a lemongrass and ginger syrup. It was refreshing and really did the trick. Dessert of Plantain pudding came next in the form of a moist slice of Light Christmas pudding. It was served with vanilla and coffee mascarpone cream. It was hard to believe that the Plantain pudding was egg, sugar and butter free. It tasted absolutely delectable. For someone who does not like fruit cake or Christmas pudding I devoured the whole plate!!!!! 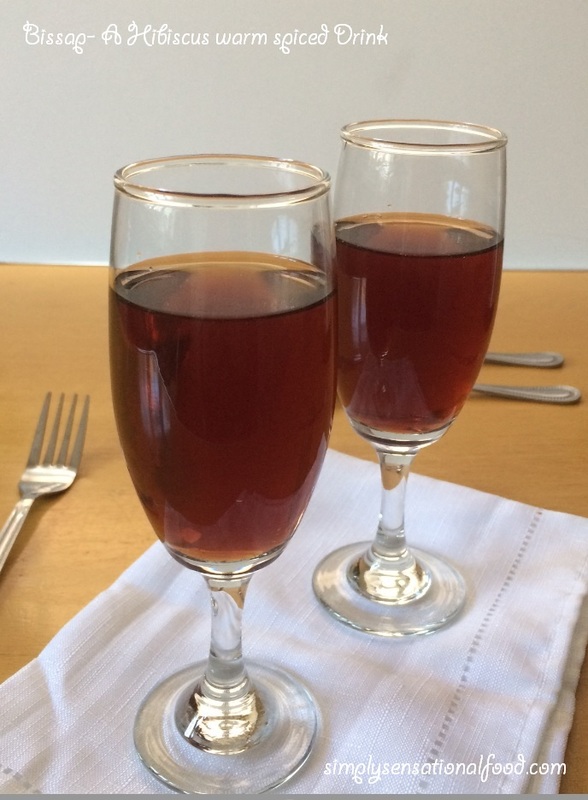 Finally the meal was completed with a warm glass of Hissap, a hibiscus drink infused with warm spices. I was totally in heaven at this super gastronomical feast and my love for Ghanaian food has now been taken to new heights. You can also read about Heidi's account of our experience here. My first experience of River cottage was when I attended a bloggers cookery day there last year. 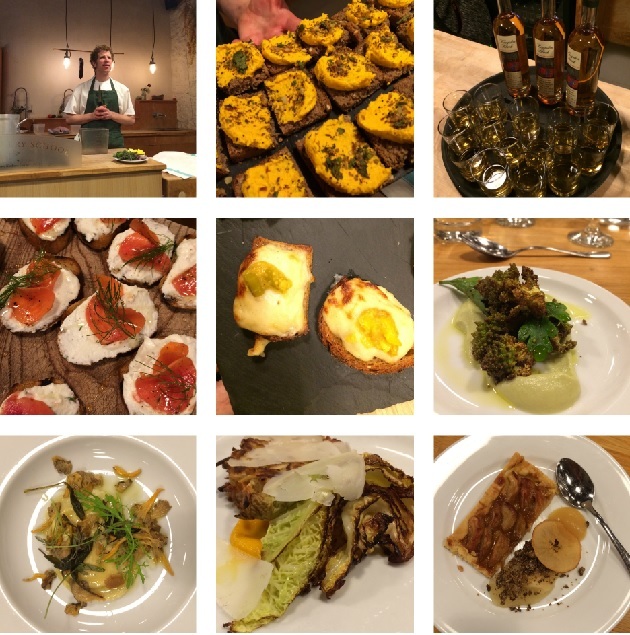 It was an amazing experience so I was well and truly excited when I was invited again to visit River Cottage for a special Bloggers Christmas Feast. 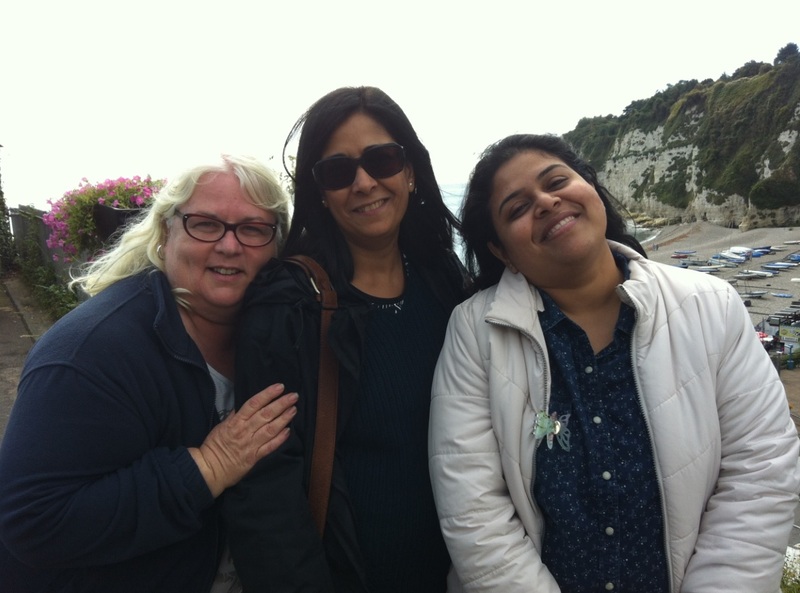 As soon as we had confirmation my two food blogger buddies Heidi Roberts and Manjiri Chitnis and I known to our friends as "The Three Musketeers" excitedly booked trains, accommodation and started to plan our two night stay. 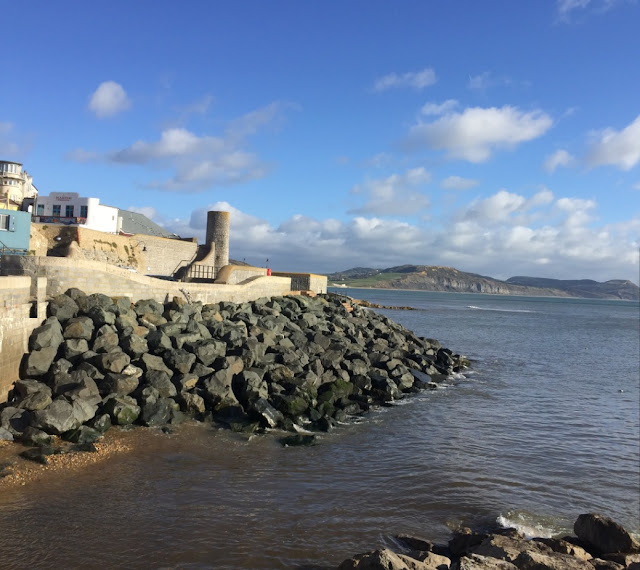 We like booking an extra night to make the most of the trip as the nearby Lyme Regis is so lovely as is all the Jurassic Coast. Our accommodation for the two nights was Millwater House B&B, the owners Tim and Ruth are really lovely. 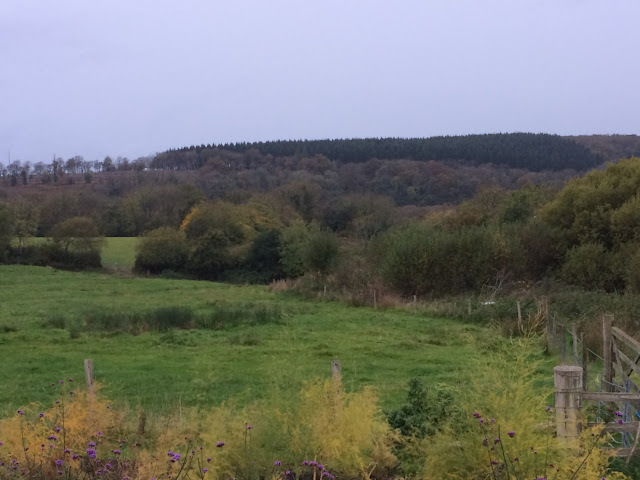 Millwater House is set is set in a beautiful location with great views very close by to Axminster town . 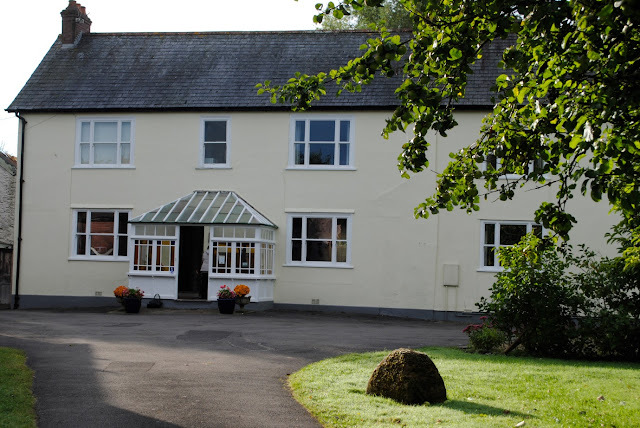 The bedrooms are comfy and the cooked breakfast is absolutely delicious. On both our trips we have stayed at the same B&B and we love it. Tim is a gem and he even picked us up from the station and ferried us to and from River Cottage as there was a shortage of taxis. 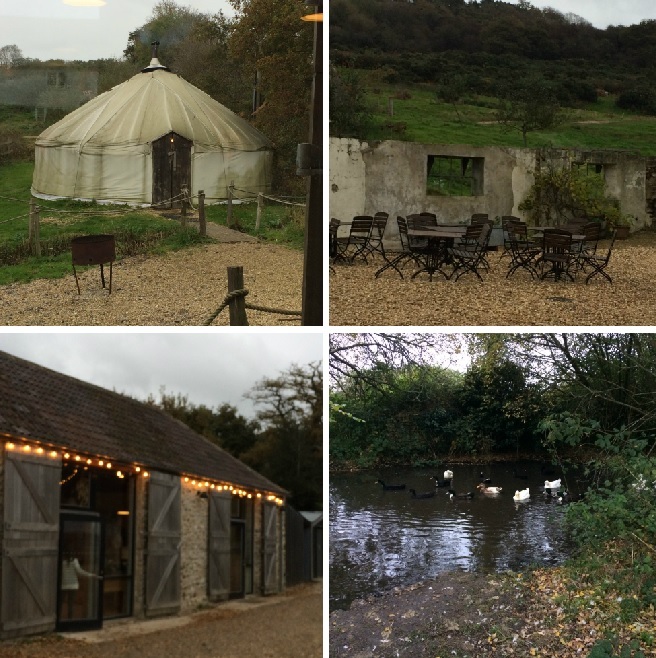 There were approx 50 bloggers who attended the Christmas feast at River Cottage. Upon arrival we had welcome drinks and then we were free to wonder around the farm to check it out. Next we had a session in Brining by Andy one of the River Cottage Chefs. He showed us various techniques on the subject. Although mostly it was about brining meat he did say that you can also brine vegetables and gave me some great ides on how to brine cucumbers, courgettes and root vegetables that can served as condiments or in salads. The evening carried on where the bloggers split into two groups and did some networking. This was the perfect opportunity to meat new and old faces and share ideas. With the networking over it was time for the feasting. River cottage chefs had been busy all day so that we were served a magnificent Christmas feast. They had catered for all types of diets, vegetarians, non vegetarians, dairy and gluten free too. We were served Kingston Black Apple brandy aperitif served with Canapés of Carrot hummus on rye bread, whipped goat’s cheese and beetroot marinated in cider vinegar, leek, mushroom and blue cheese croquettes with green tomato chutney and finally roasted Romanesco with Romanesco puree. For the vegetarian starter we were served Ravioli with celeriac puree cooked with wild mushrooms, sage and served with salad leaves. The feasting continued with a wonderful dessert of Apple tart served with apple purée, apple crisps and apple rye & treacle crumble. There was also the option of honeycomb crème brûlée. Finally when we thought we could eat no more we were enticed with coffee and chocolate orange truffles and spelt biscuits .The entire experience was a culinary delight and a very pleasurable one. 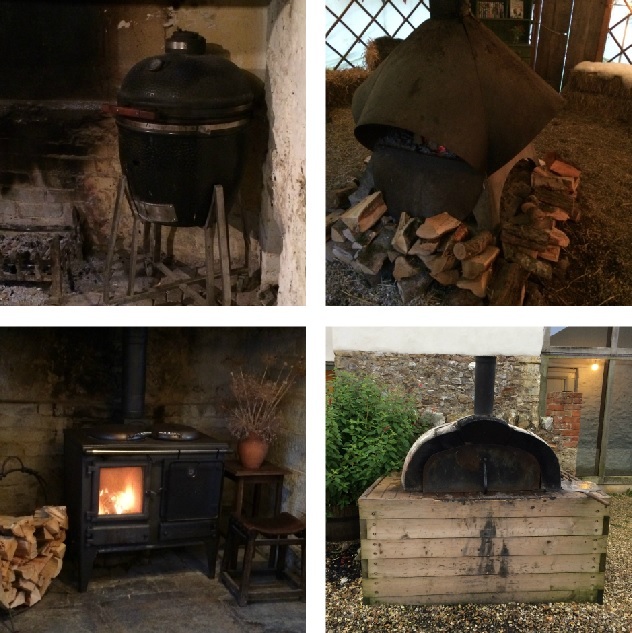 I was a guest at River Cottage, all opinions expressed in this post are my own as are all the photographs shown. To read Heidi's account of her experience do read her post here. Ghana is a West African Country, it is thought to be the closest country to the centre of the Earth. It is located North of the Equator which means that it has a warm tropical climate. Until a few months ago I did not know much about Ghana, but my interest grew when my daughter decided to go on a trip to Ghana with Vision Aid oversees to do voluntary work to provide free eye care for the less privileged. As a parent to alleviate any worries, I started to research about the safety, climate, food etc in Ghana. To my surprise I really started to enjoy learning about the culture and food, especially as many of the ingredients such as plantain, cassava, chillies, yam were foods I am familiar with since I have lived in East Africa in my childhood.The typical Ghanaian staple foods in Ghana include cassava and plantain, millet and sorghum. Vegetables such as Yam, maize and beans, Sweet potatoes and coco yam are regularly used in Ghanaian cuisine. Since we follow a vegetarian diet, we researched what vegetarian dishes would be available in Ghana, we were pleasantly surprised to read that there were a fairly good selection such as Jollof Rice (spicy vegetable rice), Kelewele ( a fried spicy savoury dish made from plantain), Gari Foto (A grain made from fermented cassava flour cooked with tomatoes and vegetable and Watchi (blackeyed peas with rice. )I have been recreating some of these recipes in my kitchen and I must say we are really enjoying the Ghanaian flavours. 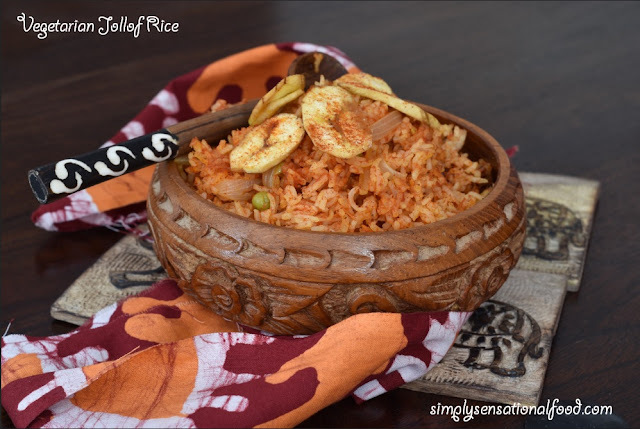 One of our family favourites is the Jollof Rice, in Ghana you an get both a non vegetarian version and also vegetarian version. Below you can check out my vegetarian version. I made my Jollof rice in my Redmond Multi Cooker, which is my new kitchen friend. Simple and easy to use with many pre programmes it makes cooking quick and easy. 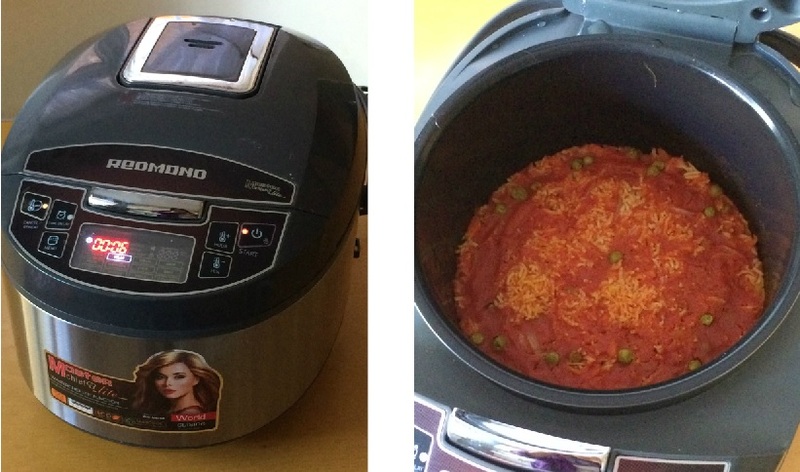 If you don't have a multi cooker you can make the rice on the stove top too. 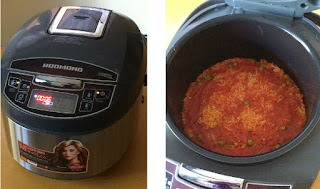 Spicy vegetarian rice cooked with tomatoes and vegetables. 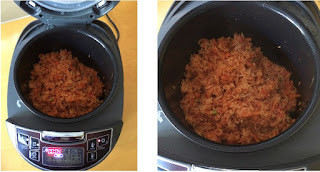 1.Wash the rice in a few changes of water, drain and keep aside.2. In the Redmond multi cooker add the olive oil and set the multi cooker on Fry option. Add the onions and cook them for 3-4 minutes, once onions are translucent add the grated carrot and capsicums and cook for another 3-4 minutes. Cook with lid open. 3. Cancel the fry option and set the programme on pilaf option. Add the rice, peas, salt, chilli powder, red chilli, turmeric, tomato passata and water. Stir. 4. 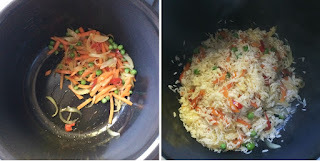 Close the lid and cook the rice on pilaf option for 25 minutes.5. After 25 minutes open the cooker lid and fluff up the rice with a fork. 7. Drain the fried plantain on kitchen paper and fry the remaining.8. Sprinkle salt and chilli powder on the fried plantain.9. Transfer the rice to serving dishes and garnish with fried plantain. The square brown wooden dish that the fried plantain chips are served in the photo above and the carved wooden African dish together with the elephant coasters which the rice is served in in the photo below are my recent purchases from Homesense. Homesense is a haven for beautiful kitchenware. The beauty of the shop is that you can find all sorts of serving dishes and kitchen ware that are regional and also from Europe, Africa, and Asia. These wooden dishes are a wonderful find as were the coasters. This recipe is in collaboration with Redmond and Homesense.